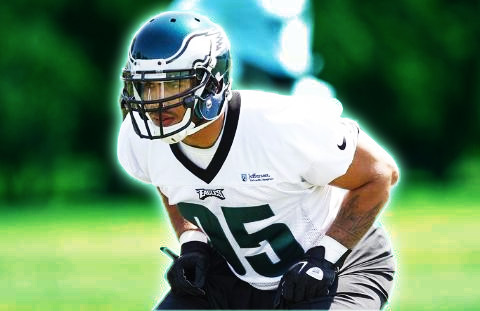 The highlight of Mychal Kendricks first real day as an Eagle came when he intercepted a pass from former Pac 12 Rival Nick Foles 30 yards down field while guarding an opposing tight end. This tight end was the 6′-5″, Brett Brackett. Keep in mind that Kendricks is only 5′-11″. Whatever doubts anyone had about this guy’s ability to cover the TE or even cover enough ground to keep up with the TE should now be on the back burner. This guy played running back in high school and did run a 4.47 at the NFL Combine. The fastest of any LB at the combine, even faster then former Eagle Mock Draft glory boy Luke Kuechly. Kendricks also posted the best Vertical Jump of 39.5″ and the best Broad Jump of 127″ among all linebackers at the combine. These numbers are only worth so much when translated to the football field, but they are a great indicator that Kendricks is physically capable of getting the job done on the NFL level. Time will tell if he can mentally master the position. During Interviews Mychal Kendricks was asked repeatedly about how his height may be a disadvantage when covering tall tight ends, Kendricks wasn’t entertaining that notion at all. He flat out said his height doesn’t matter. He went on to say that he’ll try his hardest and if he can’t get the job done he’ll probably get cut. He also mentioned that he’s not stressing about it and that the reporters shouldn’t stress about it either. Is this guy a Swag Factory or what? Telling reporters how to do their jobs is brilliant. At no point was he disrespectful, but always direct and never doubtful. There were times during earlier interviews that he appeared to be slightly unsettled, unsure of how he’d be used exactly in the Eagles defense. But after a day of camp work I see no remnants of that feeling and he’s back to being a Swag Factory. Kind of hoping that nickname catches on, maybe he could become the new Old Spice guy one day. People should also really appreciate what this guy has to offer. For years the Eagles have filled the LB Corps with late round pick after late round pick. This is the best athlete the Eagles have inserted into the LB group through the draft possibly ever. I also believe that whatever Kendricks is lacking as a linebacker overall that can’t be taught by the coaches, Demeco Ryans will teach him. He has been a major contributor to the growth of the LBs on the Texans defense, that kind of thing doesn’t happen by accident. Look for a major improvement from the LBs overall this coming season. Especially Brian Rolle and Casey Matthews. Kendricks has been a lot of fun to watch so far, but I still can’t say I love the jersey number he got stuck with. Hopefully the Eagles don’t rope him into keeping it and let him change after the final cuts are made. What do you think of Kendricks so far? Can he be a major contributor and start from day one?